Crowdfunding can be described as the process of raising funds with the help of friends, family, customers, and investors. This is typically done online via a website or through social media to reach a large audience. If you’re planning to do any crowdfunding of any kind on WordPress, you’re in the right place. You don’t have to use KickStarter or Go Fund Me, you can do it right from your own site! Here’s a list of some of the top crowdfunding options, fundraising solutions and ways to accept donations, a selection including plugins & themes for WordPress. To help you weed through all the options available, here are 6 WordPress crowdfunding plugins worth looking into (in no particular order). Some of these can also be used for fundraising or to accept donations. WP Crowdfunding is a great WordPress plugin for fundraising/backer sites, created by the team at Themeum. For crowdfunding options, this is a great solution as it integrates with WooCommerce and lets you launch a site just like Kickstarter. It currently has over 1,000 active installs with a 4.5 out of 5-star rating, and is actively updated. Distribute all funds via PayPal Adaptive, Stripe Connect, Skrill, Authorize.net, and more. Centralized native wallet system: The project owner can send a withdraw request to the admin after raising a certain amount of money. It calculates the withdraw-able project funds, website commissions and generates statistics. IgnitionDeck is probably one of the most well-known crowdfunding solutions and plugins in the WordPress space. It currently has over 3,000 active installs with a 3.5 out of 5-star rating. Ignition Deck has worked alongside AppThemer in the past to build crowdfunding WordPress themes. The plugin works with any WordPress theme, which means you don’t have to buy a new theme to get started. Although the plugin itself is free, you will most likely need to purchase their premium version of IgnitionDeck to take full advantage of all the crowdfunding features. You can determine that after trying the free version. When you install the plugin a widget is added to your dashboard that you can insert into a sidebar to highlight your crowdfunding campaigns to your visitors. The plugin comes with comprehensive resources for developers and also articles on general WordPress functions. The premium version of the Ignition Deck plugin is so much more powerful than the free version, it merits its own description. The premium plugin package comes bundled with a variety of different skins that have an almost iOS-inspired design to them. The column configuration of the skins allow you to display information about certain crowdfunding campaigns in an ordered fashion — you can highlight the campaign goal, number of donors, amount raised, end date, percentage raised, and a call-to-action button for people to process donations in each campaign’s little window. Ignition Deck comes with another unique feature that no other plugin in its niche offers — access to numerous extensions. These extensions have a myriad of functions. For instance, you can add the Bitcoin, WePay, Amazon, Braintree, PayPal, and Stripe payment gateways to your crowdfunding website. You can also purchase an extension that will allow you to configure your Constant Contact autoresponder so that each donor gets signed up to your mailing list. The Twilio SMS extension allows you to be notified of new donations with a text message. There’s an extension for almost every scenario to fulfill every function you could desire. The plugin will work with any theme, but only a few themes have built-in styling and custom options for the Ignition Deck (we’ll take a look at some of those later on in this post). The developers have also released several premium WordPress themes designed to operate smoothly with the plugin (you’ll also see them later on in the post). All things considered, the premium version of Ignition Deck is probably the most popular standalone plugin crowdfunding solution that there is for WordPress. You would do well to purchase it. WordPress Fundraising is a plugin release from the folks over at WPMU Dev. Fully functional and compatible with any theme, the plugin integrates with both Multisite and BuddyPress to give you the potential to create a full-fledged crowdfunding network. You can choose to receive funds immediately after they have been collected, or only if and when the project has been fully funded. Expiration dates for each new project can be set, and you can customize donor rewards for specific contribution levels. You can also allow recurring donations, create personalized thank you messages, and use multiple currencies. To get access to the WordPress Fundraising plugin, you can either purchase it, along with updates & access to support, for $19 monthly or you can become a WPMU member for $24.50/month and get all the above as well as plenty of other goodies from the WPMU developers. Give is a WordPress donation plugin created by the awesome team over at WordImpress. These guys are very active in the WordPress community and are very good about keeping their plugins up to date. While this is more for donations, you could use this as a way to crowdfund something. However, you won’t find the typical features like you might be looking for if you are trying to create a KickStarter clone. One of the other plugins we have mentioned might be better suited for that. But if you want a way to accept donations from the masses, Give is a plugin you can’t ignore! InFunding is a free WordPress crowdfunding plugin to create charitable program and appeal for donations with PayPal or bank transfer. This is created by the team over at InwaveThemes. It currently has over 500 active installs with a 4.5 out of 5-star rating. Another free plugin you should check out when looking for crowdfunding options is Crowdfunding for WooCommerce. 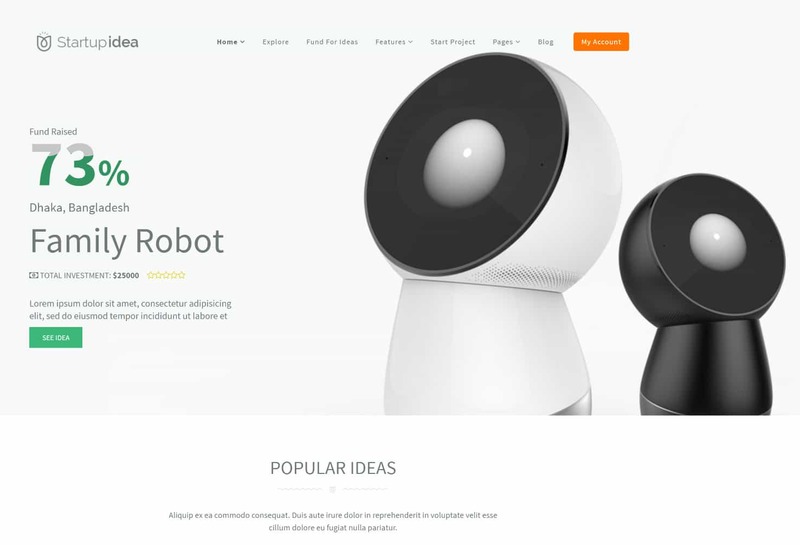 This is developed by the team over at Algoritmika Ltd, which currently have over 30 plugins in the WordPress repository, and most of them relate to WooCommerce. These guys are no newcomers when it comes to building out solutions that play nice with e-commerce solutions. This plugin currently has over 500 active installs with a 5 out of 5-star rating. Modify info such as goals, time remaining, how much is funded, etc. Here are 6 WordPress crowdfunding themes worth looking into (in no particular order). 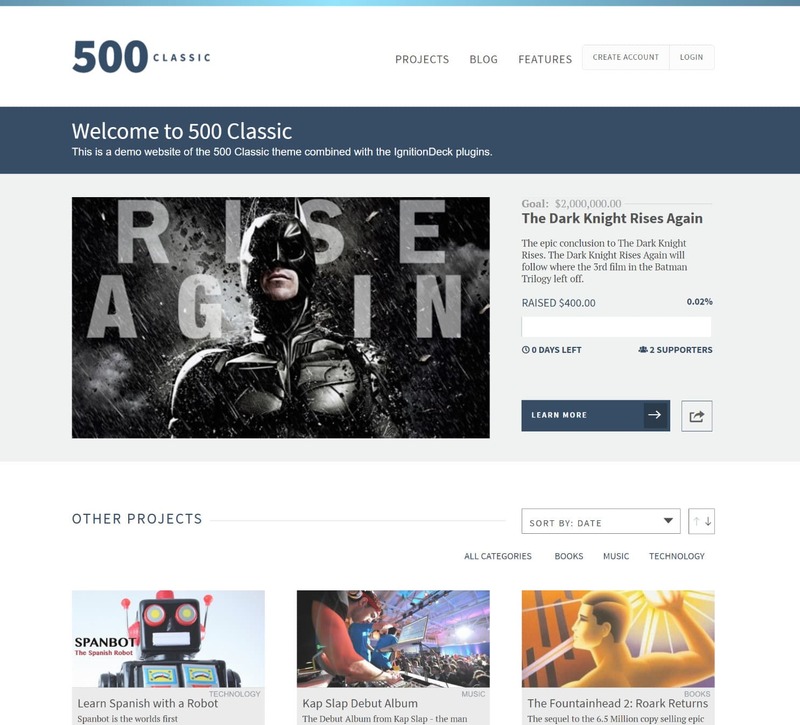 500 Classic is actually a free theme that is part of the 500 framework from IgnitionDeck which was mentioned above. The company has already developed several themes on the 500 framework, all premium, that require the purchase of the Ignition Deck plugin for crowdfunding abilities. The theme has dark highlights, contradictory to most of their themes. The typography is crisp, the layout simple, and the theme perfect for a crowdfunding website. You definitely want to check out 500 Classic if you’re on a budget. 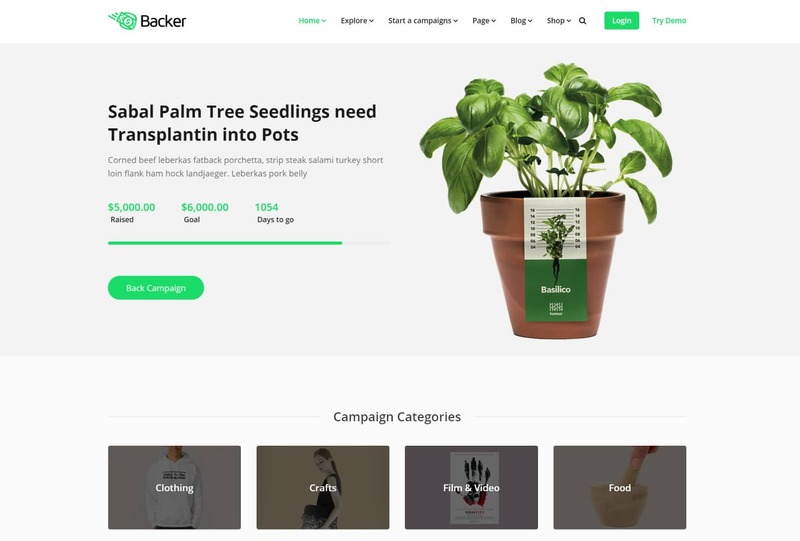 Backer is a modern crowdfunding theme with a great minimal design. The styling of the theme really focuses on white space and gives your content plenty of room to breathe. The typography sets off the text quite nicely. It also provides the WP Crowdfunding premium plugin for free with the theme package. The Backer theme has recently been completely rewritten and now even includes the popular Elementor page builder. It is completely responsive and retina-ready with plenty of shortcodes, Google fonts, and lots of different layout options. It also comes with WPML support. Once you set up your crowdfunded projects, you can choose to display them on your home page in a neat little grid with 2 built-in design styles. The theme comes packaged with custom widgets that display project categories and allow visitors to search your existing projects. One especially cool feature of the theme is the option for front end submissions, so your website even has the potential to become a resource for others looking to crowdfund their own projects, just like Kickstarter. Fundingpress is a nifty little theme, with one great thing going in its favor: you don’t need any external plugins, like IgnitionDeck, Easy Digital Downloads, WooCommerce, or the like, to actually start a crowdfunded project. Everything you need comes in the purchase package. The styling is very basic. By no means will it blow anybody’s mind, but it gets the job done well, allowing you to highlight what’s important: the content. The built-in crowdfunding feature is quite serviceable, with an option to collect funds only if the target amount has been reached. Like the Backer theme, it also has the option for front end project submission, and it comes with Layer Slider integrated along with a cool 1-5 star rating system for your post types. However, Fundingpress only fetches a 3.5 star rating on ThemeForest after over 1,400 sales; a few users have complained about having difficulty with getting in touch with the developers for support, so keep that in mind if you decide to purchase. 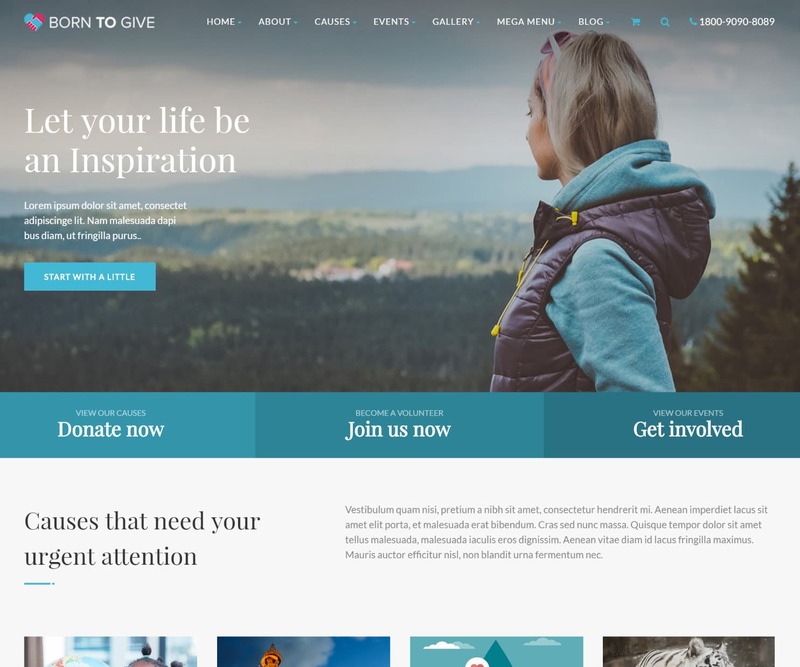 Born to Give is a responsive and retina ready WordPress theme focused specifically on crowdfunding for charities and nonprofits. The Born to Give theme has a very elegant and modern look to it. It is based on the popular Twitter Bootstrap 3x framework that makes it available for all screen sizes. It has easy integrations right out of the box for PayPal, Stripe, Authorize.net, PayFast, and even PayUMoney. It receives regular updates from the developer and has a 4.4 out of 5-star rating with over 750 sales. The theme actually has a free built-in event manager and is WPML compatible. It utilizes the free Charitable WordPress plugin to launch and maintain crowdfunding campaigns. 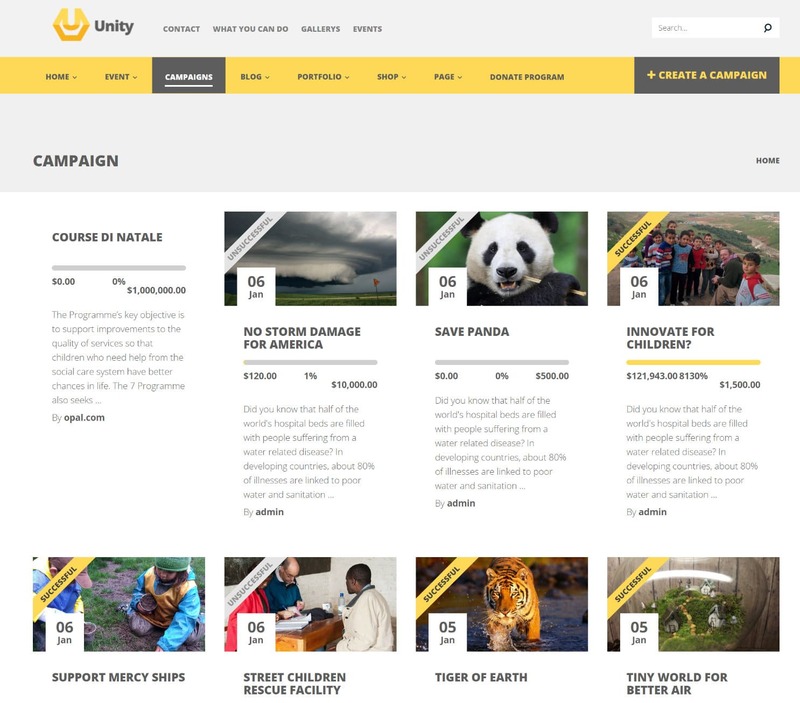 Unity is another great theme if you are looking for WordPress crowdfunding options. This theme is actually built upon Easy Digital Downloads, but also supports WooCommerce. It is fully responsive and built upon the WPO Framework and Bootstrap 3.0. The Unity theme is very customizable with a live theme editor built into it. You don’t need to know code to edit this theme. However, with that being said it was also built with developers in mind and even Sass has support. The theme has over 750 sales with a 4 out of 5-star rating. 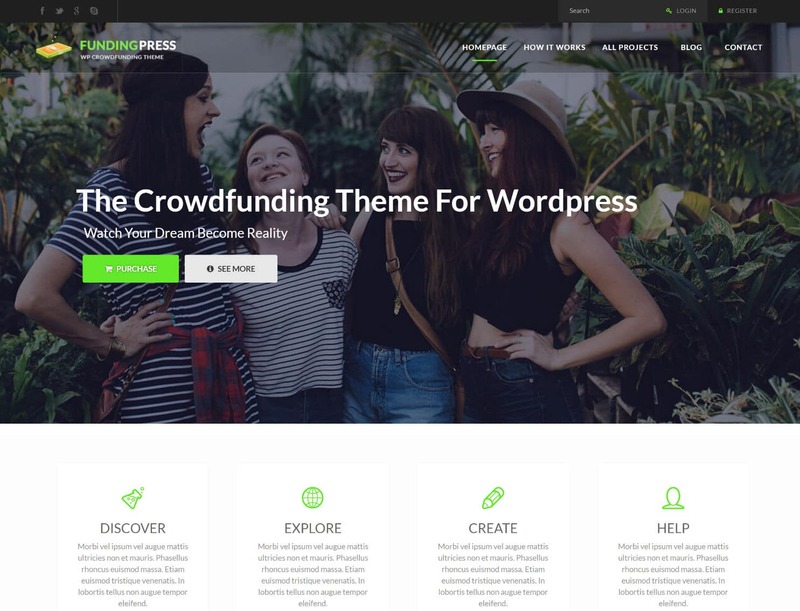 If you love modern, clean, and simplistic designs, you will definitely want to check out the Startup Idea crowdfunding WordPress theme. It is based on the WooCommerce platform and allows you to easily launch single products or an entire catalog. One big area where the Startup Idea theme shines is in its design! With a more minimal approach, you can ensure that visitors are focused on your campaigns and not easily distracted by other things on your site. It utilizes the free WP Crowdfunding plugin we mentioned above to build, launch, and edit campaigns. It is fully compatible with all major payment processors and has a 4 out of 5-star rating with over 500 sales. Nowadays, you don’t have to resort to a website like KickStarter, Go Fund Me, and You Caring to set up your own crowdfunding campaigns. Instead, you can look professional running the campaign on your own website without having to pay any fees to third-party websites. TechCrunch also published an entire crowdfunding guide which is worth checking out. Learn more about what it takes to have a successful campaign with some real world examples. With crowdfunding plugins and themes like these, WordPress is becoming even more powerful, much more than just a blogging software. So what are you waiting for? 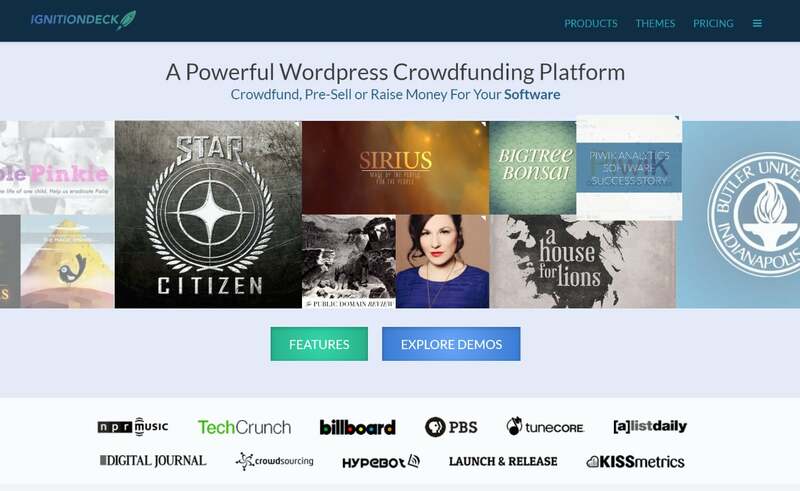 Download one of these crowdfunding options and start raising funds on your very own WordPress website today!